This weekend several teams from the valley headed to Colorado Springs to play in the Colorado Springs Amateur Hockey Association’s (CSAHA) President’s Day tournament, where they competed against teams from all over the U.S. and Canada, including our Bantam A team. Their first game was against the Flagstaff North Stars. After the first period they were behind 1-0. At the start of the second period, a pass from John Smith to Luke Collins ended in a goal, followed by a goal from Hunter Wright. Going into the third period, they were tied 2-2 when Flagstaff scored. With 33 seconds left in the game, Luke Collins found Kaden Hardesty, who found the back of the net to tie up the game 3-3. Their second game was against the Florida Golden Wolves. They were on fire winning 9-2 with goals by Luke Collins, Joseph Coburn, Dom Picarro, Hunter Wright, and John Smith, and assists by Chris Myers, Joseph Coburn, Scerek Romero, Kaden Hardesty and Camden Scales. Their third game against the San Diego Oilers was a much closer game with a 3-1 win. Goals were scored by Dom Picarro, Joseph Coburn and Hunter Wright. Their fourth game, which would decide if they made it to the finals, was against the Pueblo Panthers. They won 9-1 with goals by Camden Scales, Dom Picarro, Joseph Coburn, Joseph Stock and Hunter Wright and assists by Dom Picarro, Rowan Picarro, Camden Scales, Luke Collins, Joseph Coburn and Matthew Solanik. With three wins and a tie the team was seeded second and had to play the undefeated Texas Warriors that were seeded first. This was a nerve-racking game. In the first period, Scerek Romero found Hunter Wright, scoring the first goal of the game. They were ahead 1-0 going into the second period. The Texas team came out hitting and scored to tie 1-1. Later in the second period, a pass from Hunter Wright to Scerek Romero had the Bantams up 2-1.
Credit should be given to the whole team for holding the score to 2-1, considering they had to play one man short for five minutes due to a penalty. The team really had to step up their game. The defense, John Smith, Chris Myers, Rowan Picarro, and Kaden Hardesty with goalie Shaughn Rourke were invincible during this critical time, knowing what was at stake. Winning this game led to the championship game against the Aspen Leafs. Despite being short benched due to injuries, our team went in to win it. Aspen was ahead 2-0 in the second period when John Smith found the back of the net with help from Scerek Romero and Joseph Coburn. The team rallied. In the third period Dom Picarro scored, making the game 2-2. Both teams battled hard but could not score. The game ended with a 2-2 tie. Next was a five-minute overtime with no score. 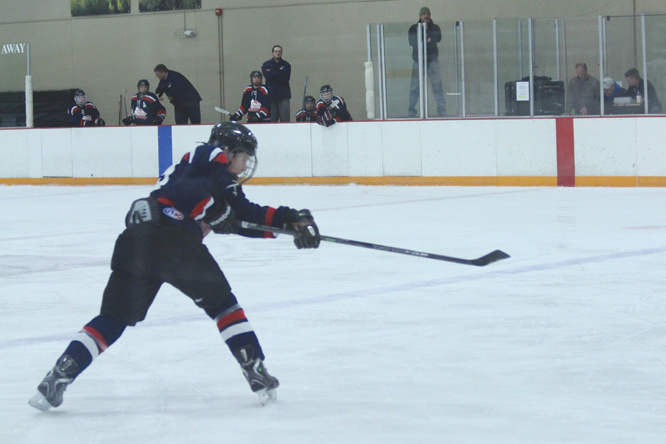 The game ended in a shootout, with the 3-2 loss to Aspen. A great effort was made by our goalie Shaughn Rourke. Our kids played with all their hearts and souls and left everything on the ice. They should be proud of their great accomplishment placing second in such a prestigious tournament.